After spending a few busy days touring around Prague, we were ready to get away from the crowds and the city for a little reprieve and the Strahov Monastery was the perfect escape. We crossed the bridge to the bottom of Petrin hill where we rode the funicular to the top and then enjoyed a leisurely walk high above the city to the monastery. 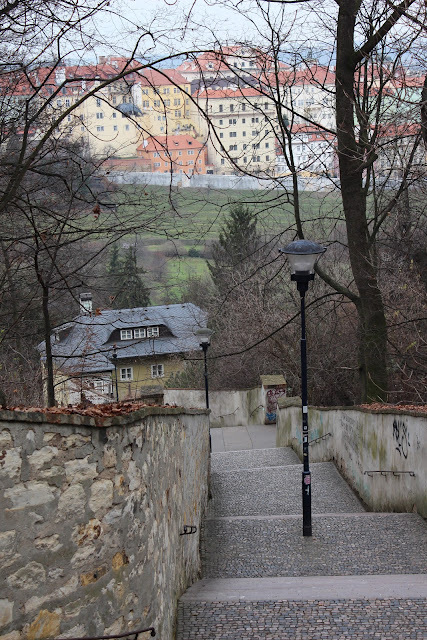 The walk itself was quiet and serene with the most beautiful views of Prague. We took our time, stopping to take photos and admire the scenery. Had it been a bit warmer, it would be a lovely place to enjoy a picnic or a bottle of wine. Once we reached the top, we wandered around the exterior of the monastery but we chose not to tour the buildings. Much to Joe's delight, the monastery also featured a brewery so we stopped in to warm ourselves around a pint or two before descending on foot. Exactly. Is this a working monastery, Jay? Yes - founded in 1140 and still working today. I read somewhere that it houses around 70 monks. Ah, it looks so stunning! When I did a big European tour a few years ago, Prague was one of the key cities that I was bummed was not on the tour. I've heard more than amazing things about it - would love to see it for myself. Thank you for sharing!